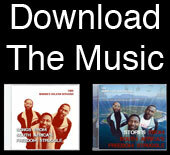 The Robben Island Singers are three former freedom fighters who were once imprisoned with Nelson Mandela in South Africa's most notorious Apartheid prison. Now they've become cultural activists who use the songs and stories from their struggle to inspire others-- and they're the subjects of an upcoming documentary film. As teenagers they took the path of armed struggle. In 1976 they snuck out of their country to get military training. In his own way each fought against Apartheid. Captured, tortured, interrogated, tried for treason and terrorism, they would meet in a communal cell on the island. Mandela was already there serving a life sentence. Dreams of personal and national liberation came alive when prisoners sang in harmony. Singing became a key to survival. A way to fight back. The Robben Island Singers upcoming documentary sheds light on the reasons why three former freedom fighters now sing prison songs in American high schools, churches and concert halls. And why American youth sing with them. The Singers want to visit cities around the world and encourage audiences to stand up for what they believe; to recognize the universality of the struggle for human rights and dignity; and to learn forgiveness in order to achieve peace. Thousands have greeted them in Illinois. Millions more will meet them in the near future as their journey unfolds on screen, and in classrooms and sanctuaries around the globe.